Cordless Top Down Bottom Up (8) ? For energy-efficient light control, corded and cordless pleated window shades are the way to go! A classic application of form following function, these are some of the most versatile shades you’ll find to complement the most discriminating design tastes. 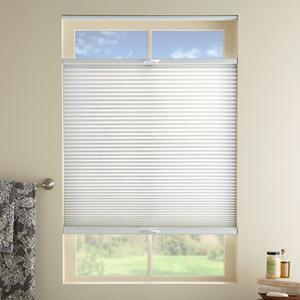 Similar to honeycomb/cellular shades, pleateds have some unique differences. They’re made from a single layer of fabric filled with tiny, insulating cells and folded into crisp pleats, whereas honeycombs are made from multiple layers. The pleats block harmful UV rays and trap unwanted air and moisture (ideal for bathrooms and kitchens!) for greater energy efficiency and cost savings. Pleated window shades are also considered a more budget-friendly alternative to honeycombs, so if you’re looking for attractive, affordable ways to control light and energy costs, just say ‘Pleated, please!’ Need more help on deciding if a cordless pleated shade is right for you? Check out our comprehensive buying guides. Cordless Lift System – Child safety is top-of-mind at Select Blinds. That's why all of our pleateds come available with a cordless lift system. Simply raise and lower the shade all from the bottom rail. Cordless Top Down/Bottom Up Lift System – This lift system lets you lower your pleated shades from the top, letting in natural light while keeping the bottom closed for more privacy. Are pleated shades out of style? No way! You can customize them to fit the latest design trends with a variety of colors, fabrics, styles and other options. 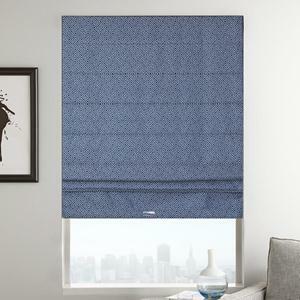 No-Holes Privacy – Pleated window blinds have little route holes through the fabric that allow the internal cords to lift and lower the shades. These route holes let in little pinpricks of light. If that bothers you, you can always upgrade to no-holes privacy. Instead of the cords coming through the fabric, they go through tabs on the back of the fabric, eliminating route holes so no light comes through. Multiple Shades on One Headrail – If you have wide windows, you can mount multiple pleated blinds on one headrail for a smooth, cohesive designer look. The shared headrail ensures the shades aren’t too heavy and makes them easier to operate, independently or together. Ready to order your own custom pleated window shades? Start with these measuring instructions.